Fourteen persons on Tuesday lost their lives at the end of the presidential campaign rally of the All Progressives Congress at the Amiesimaka Stadium in Port Harcourt, Rivers State. The persons died in a stampede around the gate of the stadium as the crowd attempted to leave the venue of the campaign. 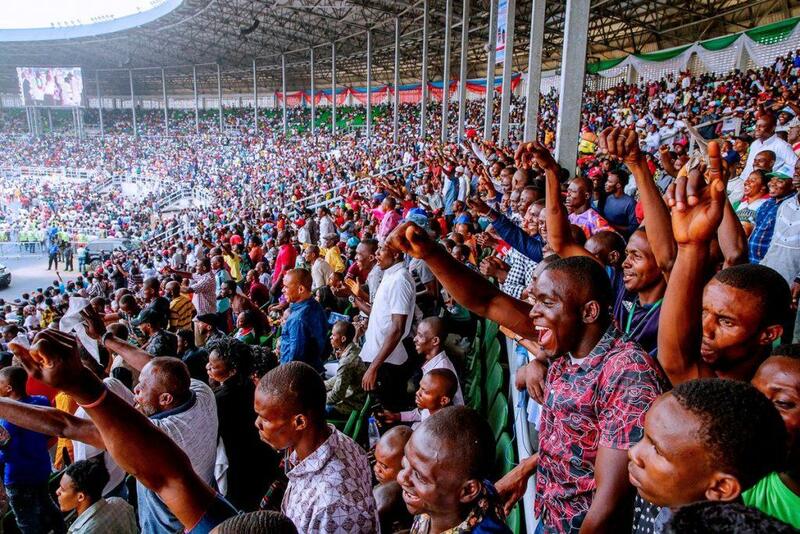 Eight other persons were critically injured as they were marched on as people rushed to go home after listening to President Muhammadu Buhari, who was the last speaker at the APC event. Those who were seen lying lifelessly on the ground include three middle-aged women and a man. The incident happened around 4pm after the President and his entourage had left the stadium. A private vehicle owner, who tried to rush one of the victims, a middle aged woman, to a medical facility to save her life, returned her corpse and dumped it on the road after noticing that she had died. The state Police Public Relations Officer, Nnamdi Omoni, confirmed the incident, adding that four persons were receiving treatment at a hospital. The University of Port Harcourt Teaching Hospital, confirmed that 14 dead bodies were brought in on Tuesday. The Public Relations officer of UPTH, Kem Daniel-Elebiga, told our correspondent this on the telephone. “Yes, 14 dead bodies were brought to the hospital this evening from the Adokiye Amiesimaka Stadium. I cannot ascertain the number persons at the Accident and emergency Ward,” he added. Earlier, President Mohammadu Buhari vowed that his administration would not allow any security agent to intimidate or disenfranchise voters during Saturday’s elections. Buhari, who is also the presidential candidate of the APC, urged candidates of the party in Rivers State to remain resolute despite the Supreme Court’s ruling barring the party’s candidates from participating in elections scheduled for February 16 and March 2, 2019. He said, “I congratulate the Rivers APC family for your strength to agree to be here since 6am in your numbers despite the effort to demoralise you. They say you are not allowed to contest in the elections in Rivers State, but I assure you, justice will be done. The APC National Chairman, Adams Oshiomhole, said the courage of the APC in Rivers State would put its enemies to shame. The Minister of Transportation, Rotimi Amaechi, stated that the APC in Rivers was battle ready to ensure victory for Buhari.